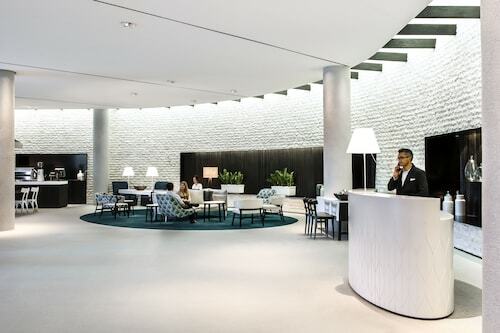 Located in Darling Harbour, this luxury hotel is within a 10-minute walk of Australian National Maritime Museum, International Convention Centre Sydney, and Sydney Lyric Theatre. SEA LIFE Sydney Aquarium and Sydney Town Hall are also within 15 minutes. Pyrmont Bay Light Rail Station is only a 4-minute walk and Exhibition Light Rail Station is 6 minutes. This darling Harbour hotel is also less than a kilometer from the restaurants, cafes, and bars of Cockle Bay and shopping at the Queen Victoria Building. 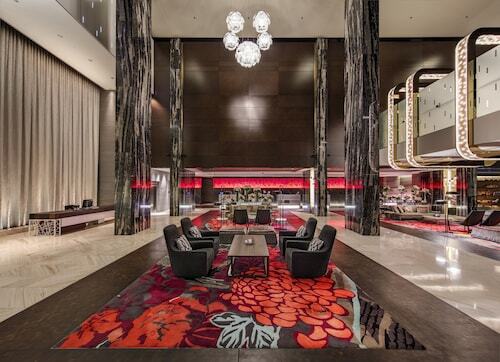 Located in Darling Harbour, this luxury hotel is within a 10-minute walk of Chinese Garden of Friendship, Sydney Town Hall, and World Square Shopping Centre. Capitol Theatre and International Convention Centre Sydney are also within 15 minutes. Town Hall Station is 6 minutes by foot and Paddy's Markets Light Rail Station is 10 minutes. 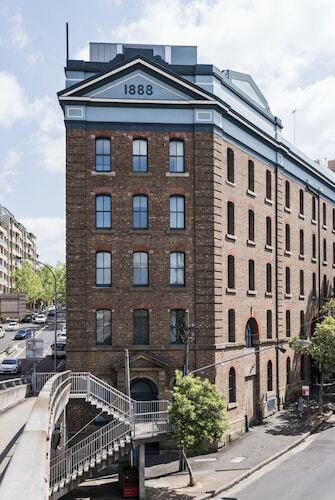 Located in Darling Harbour, this apartment building is within a 15-minute walk of Australian National Maritime Museum, Harbourside, and International Convention Centre Sydney. Chinese Garden of Friendship and Paddy's Market are also within 15 minutes. Exhibition Light Rail Station and Exhibition Centre Station are within a 5-minute walk. 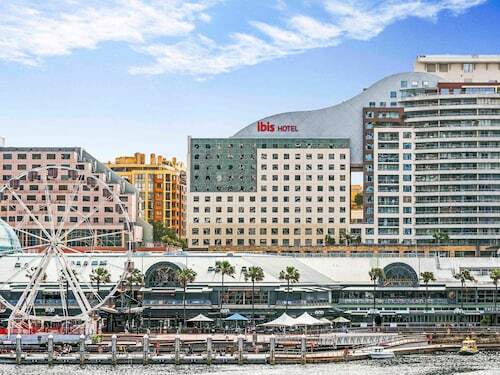 Located in Darling Harbour, this luxury hotel is steps from Harbourside and International Convention Centre Sydney. Australian National Maritime Museum and Sydney Lyric Theatre are also within 10 minutes. Convention Light Rail Station is 5 minutes by foot and Pyrmont Bay Light Rail Station is 5 minutes. 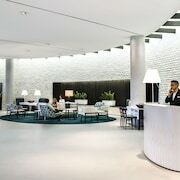 Located in Darling Harbour, this hotel is within a 10-minute walk of Australian National Maritime Museum, International Convention Centre Sydney, and Sydney Lyric Theatre. Madame Tussauds Sydney and Wildlife Sydney are also within 10 minutes. Pyrmont Bay Light Rail Station is only a 2-minute walk and Convention Light Rail Station is 6 minutes. 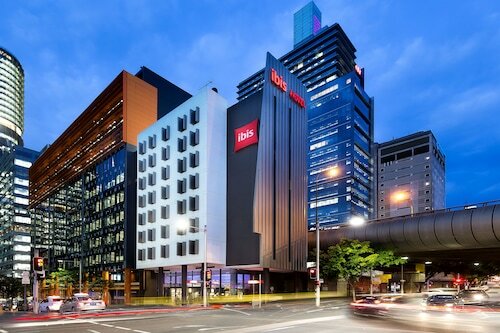 Located in Darling Harbour, this luxury hotel is within a 10-minute walk of Sydney Lyric Theatre, International Convention Centre Sydney, and Australian National Maritime Museum. Madame Tussauds Sydney and Wildlife Sydney are also within 15 minutes. Star City Light Rail Station and The Star Station are within a 5-minute walk. 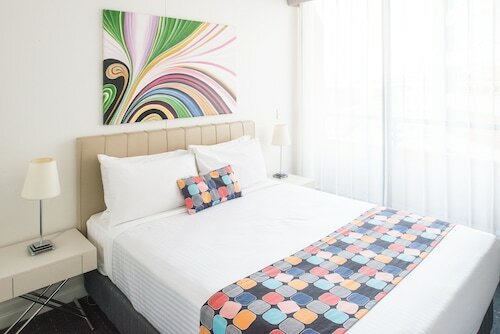 Amid shops, restaurants, and nightlife, this aparthotel is next to the Sydney Aquarium, 1 block from Darling Harbour, and 0.3 mile (0.5 kilometer) from the Pitt Street Mall. Sydney Opera House is 1 mile (1.6 kilometers) away. Located in Darling Harbour, this luxury hotel is within a 10-minute walk of Sydney Lyric Theatre and Australian National Maritime Museum. International Convention Centre Sydney and Madame Tussauds Sydney are also within 15 minutes. Star City Light Rail Station and The Star Station are within a 5-minute walk. 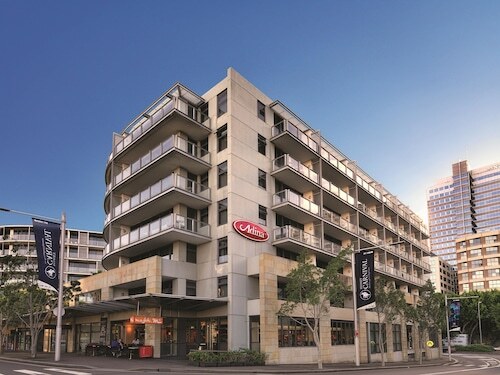 Located in Darling Harbour, this aparthotel is within a 5-minute walk of Cockle Bay Wharf and Sydney Town Hall. Queen Victoria Building and Wildlife Sydney are also within 10 minutes. Town Hall Station is 6 minutes by foot and Convention Light Rail Station is 9 minutes. 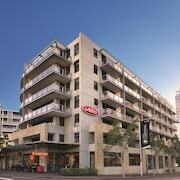 Located in Darling Harbour, this hotel is within a 5-minute walk of King Street Wharf and SEA LIFE Sydney Aquarium. Wildlife Sydney and Madame Tussauds Sydney are also within 10 minutes. Wynyard Station is 6 minutes by foot and Martin Place Station is 12 minutes. Located in Darling Harbour, this hotel is within a 10-minute walk of Australian National Maritime Museum, International Convention Centre Sydney, and Sydney Lyric Theatre. Sydney Town Hall and SEA LIFE Sydney Aquarium are also within 15 minutes. Pyrmont Bay Light Rail Station is only a 5-minute walk and Exhibition Light Rail Station is 5 minutes. If you are thinking of seeing the state of New South Wales, get to the state capital, Sydney. Situated a kilometre west of the centre of the city, you'll find the district of Darling Harbour - Pyrmont. After iconic sights like the Sydney Opera House, Bondi Beach and Sydney Harbour Bridge? Make your way to Sydney. Reserve a tour of Elizabeth Bay House, an important historic dwelling that's full of stories. Want to stay near this place? 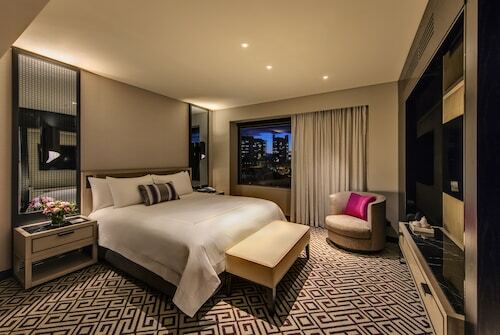 Check the rates at the Park Hyatt Sydney and Pullman Quay Grand Sydney Harbour. Fort Denison grants you the opportunity to experience where felons served timed. 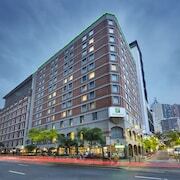 The Quay West Suites Sydney and Establishment Hotel are your top options for this attraction. If you're going to visit Darling Harbour - Pyrmont but don't want to break the bank, Wotif recommends booking a room at The Woolbrokers at Darling Harbour, where you'll find great value. From time to time you just have to spoil yourself! Look into booking one of The Darling at the Star and Astral Tower and Residences at The Star, some of the more luxurious accommodations in Darling Harbour - Pyrmont. You won't find it too hard to locate Vulcan Hotel while in Darling Harbour - Pyrmont, just follow the aroma of roasted coffee beans! As well as steaming hot drinks, they provide plenty of tempting snacks to help keep your every levels up. 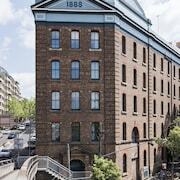 When your stomach starts thinking about dinner, go and have a look at Base Backpackers Sydney. The mains may be delicious, but don't forget to leave some room for dessert! Think about booking a room in Pyrmont or Sydney when researching your Darling Harbour - Pyrmont trip. Pyrmont is 0.4 kilometres from Darling Harbour - Pyrmont and Sydney is approximately a kilometre away from Darling Harbour - Pyrmont. When you're ready to escape the daily grind and start adventuring, Wotif will help you out, from lodgings to activities. How Much is a Hotel Room in Darling Harbour? 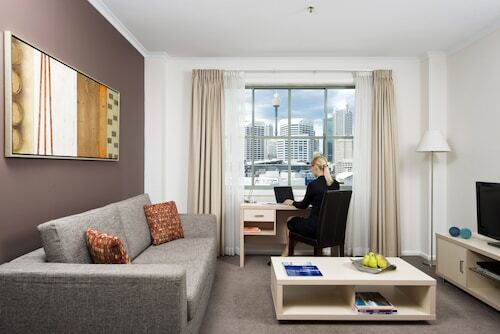 Hotels in Darling Harbour start at AU$119 per night. Prices and availability subject to change. Additional terms may apply. Very minor, only two tea bags available. Room was very clean, a little noisy from other occupants, but that’s not the hotels fault. Young door man on Wednesday morning was extremely helpful given he is the face of Novotel, he is an asset. Friendly efficient staff. We had a double bed room which was a little compact, with only one one plastic moulded chair. Anyone else had to sit on the bed. Only tea making facility plus a small bar fridge which you couldn't adjust to make it colder! Very handy location.